The Crane is a weak animal without much strength to use in fighting. However, when necessary, it can defend itself very effectively. A Crane defending itself relies on only three things: the ability to jump, the breaking power of its wings, and the pecking of the beak. The Song Dynasty (960-1280 a.d.) in China was a sorrowful time for the Chinese. Wars with the northern barbarians (the Jin race or Mongolian), corruption in business and government, and the specter of starvation constantly oppressed the people. But in the midst of all these troubles there arose a man who showed by the purity of his spirit and ideals that goodness, righteousness, and loyalty were qualities that still lived. For countless generations after his betrayal and murder at the hands of traitors, Marshal Yue, Fei remains the ideal for the Chinese people of the completely virtuous man. In peace Yue, Fei was a great scholar of the Chinese classics, in war Yue, Fei was a brave and shrewd general who skillfully defeated the enemies of his country. Yue, Fei was born on February 15th, 1103 a.d. in Tang Yin Xian, Henan Province. While he was being born, a momentous event took place: a large, powerful bird called a Peng flew onto the roof and began to make a tremendous noise. The father sensed that the bird’s presence was an omen which foretold a tumultuous yet inspired fate for his son; the father thus named his son Fei which in Chinese means “to fly.” This reflected the father’s belief that his son would fly to great and noble heights as a man. When Yue, Fei was but one month old, tragedy struck: the Yellow River flooded. Yue, Fei’s mother saved herself and her infant son by taking refuge in a giant urn; the urn acted as a small boat and took both mother and son to safety. When they reached dry land and the flood had receded, they went back to find that their home and property had been totally destroyed. Yue, Fei’s mother was very poor, but she was a well-educated scholar, and possessed the courage, intelligence, and bravery to raise her son properly and give him noble ideals. Because they were too poor to pay for an education, Yue, Fei’s mother taught him personally. Each day she taught him how to read and write by drawing figures in the sand. Even though he lacked the books, paper, and brushes that other children had, the poor Yue, Fei became one of the best educated youngsters in his village; few children could match his scholarship. In many ways the most important person and the greatest influence on Yue, Fei’s life was his mother. All the ideals that Yue, Fei lived and died for were taught to him by his mother as they held their own classes using the sand as a blackboard. Without his mother’s teachings and example, Yue, Fei would never have become the brave, intelligent, and loyal leader that he was. The young Yue, Fei was a very avid reader. His favorite subjects were history and military theory. The book he admired and studied the most was Sun’s Book of Tactics (Sun Zi Bing Fa) by Sun, Wu (c. 557 b.c. ), which described the theory and practice of warfare. From this book Yue learned important principles which later helped him in his military career. When Yue, Fei was a young man he became a tenant farmer for a landlord named Han, Qi. After long hours of work he would come home to continue studying with his mother. Yue, Fei was much admired for this, and for the great physical strength he showed as a young man. As in scholarship, no one could match his natural power and speed. These admirable qualities were noticed by a certain man in the town called Zhou, Tong. Zhou, Tong himself was a scholar and a very good martial artist who had studied in the Shaolin Temple. Seeing that Yue, Fei possessed many noble qualities, Zhou, Tong began to teach him martial arts. Martial arts as it was taught to Yue, Fei was a complete system involving barehand combat, weapons, military tactics, horsemanship, archery, and other related subjects. By constant practice Yue, Fei mastered everything Zhou, Tong taught. When Yue, Fei was nineteen years old (1122 a.d.) he decided to aid his country by joining the Song army in its war against the Jin, a nomadic people who had invaded the Northern Song. The Song Dynasty, which was originally located in northern China, had to move to the south to re-establish itself with a new capital and emperor because the Jin had sacked their old capital and captured their emperor. The Song Dynasty which was invaded is known as the Northern Song (960-1127 a.d.), while the Song Dynasty that established itself in the South after the Jin invasion is known as the Southern Song(1127-1280 a.d.). For years the weakened Southern Song had to pay tribute to the Jin to keep them from attacking further south. When Yue, Fei joined the army, the Southern Song was trying to regain its lost land by war. Yue, Fei proved himself to be an extraordinary soldier. His wisdom, bravery, and martial skill earned him promotion after promotion so that he became a general after only six years. Later, Yue, Fei became the commander or marshal of the army that was assigned to fight the Jin. Upon assuming command, he instituted a systematic training program in martial arts for his soldiers. Although some martial training had previously existed, Yue, Fei was the first to introduce Wushu into the army as a basic requirement before combat. Many times a young man joined the army only to find himself in battle the very next day. After a while, Yue’s troops, known as Yue Jia Jun (Yue Family Troop) became a highly efficient and successful fighting unit. The success of Yue’s troops can be basically attributed to three things. First, he made all his training strict; the troops were trained in a serious and professional manner. The soldiers were pushed until they excelled in martial arts. Second, Yue, Fei set up a military organization that was efficient and well run. Third, and most important, Yue, Fei created for his troops two new styles of Wushu. The first style which he taught to the troops came from his internal training, and led to the creation of Xingyiquan. The second style, which he created out of external Wushu, was Eagle Claw, a style which put a major emphasis on Qin Na. The external style, because it was learned more easily, and because it had immediately practical techniques, made Yue’s troops successful in battle. With his highly trained troops Yue, Fei was in favor of pressing the attack against the Jin. He was so loyal and patriotic that he felt it was shameful for the Song to pay the Jin tribute. Yue, Fei constantly felt intense personal agony from the humiliation that his country suffered. With the desire to free his country constantly on his mind, Yue, Fei on his own initiative advanced his troops against the Jin to win back honor for the Song. When Yue, Fei went into battle, his highly trained troops had many victories as they began to march north. But Yue, Fei had not yet encountered the Jin commander Wu Zhu, who himself had never lost a battle. Wu Zhu’s terrifying success was largely due to his main weapon-the feared Guai Zi Ma. The Guai Zi Ma was an ancient version of the tank. It was a chariot carrying armored men, drawn by three fully armored horses which were connected by a chain. It was extremely difficult to disable either the horses or the riders, and so they completely dominated the battlefield. At last, both generals met on a fateful day. When the battle started, Yue, Fei had the Rattan Shield Army crouching very low in the path of the Guai Zi Ma. Before the chariots could reach the soldiers, they ran into obstacles such as ditches and upright spears which Yue, Fei had had set up. Once these slowed down the chariots, Yue, Fei’s soldiers, who were mainly on foot, could move against the enemy with more ease. As the chariots advanced, the crouching men hooked and cut the legs of the horses, making them fall. It was impossible for the horses to trample the crouching men because the shields were greased, and the horses slipped every time they put their feet on them. When the crouching soldiers attacked the horses they only had to cripple one animal to stop a chariot. Once a chariot was stopped, other soldiers surrounded it and killed the riders. On that day Yue, Fei scored a military victory which lives today in history and legend. Yue, Fei then proceeded north, regaining lost territory and defeating such Jin generals as the Tiger King and Great Dragon. But while Yue, Fei was regaining his country’s honor, the Jin leaders successfully bribed one of the most infamous men in Chinese history-Qin, Kuai to stop Yue, Fei. Qin, Kuai was at that time the prime minister, and the most influential man at the emperor’s corrupt court. While Yue, Fei’s army moved north, Qin, Kuai, to accomplish his evil act, decided to send an imperial order with the emperor’s official golden seal (Jin Pai), asking Yue, Fei to come back. According to tradition, a general fighting on the front line had the option of refusing an order to retreat. Qin, Kuai was counting on Yue, Fei’s patriotic sense of loyalty to the emperor to get him back. To ensure Yue, Fei’s return Qin, Kuai sent twelve gold-sealed orders in one day; so much pressure made Yue, Fei return. When Yue, Fei returned he was immediately imprisoned. Because Qin, Kuai feared that any sort of trial would reveal Yue, Fei’s innocence, he ordered an officer named He, Zhu to thoroughly investigate Yue, Fei’s life in an attempt to find some excuse for the imprisonment. He, Zhu searched and searched, but he found nothing. Although a powerful general, Yue, Fei had never abused his position for bad purposes. He, Zhu found that Yue, Fei had lived a spartan life, and had fewer possessions than a peasant. When He, Zhu returned to Qin, Kuai, he reported only one fact of significance. When Yue, Fei joined the army his mother tattooed on his back a certain phrase: “be loyal and pure to serve your country” (Jing Zhong Bao Guo). With such an honest general as Yue, Fei, Qin, Kuai had only one alternative-to have his food poisoned. Thus was the noble general viciously betrayed by his own countrymen. Without the glory and honor that was his right, Yue, Fei died in jail on January 27, 1142 a.d. (December 29, 1141 a.d. Chinese calendar). Yue, Fei was thirty-eight years old. Later, Yue, Fei’s adopted son, Yue, Yun, and Yue, Fei’s top assistant, Zhang, Xian, were also killed. As stated in the previous article about Xingyiquan and because the origin of Xingyiquan is so unclear, many martial artists would therefore credit Marshal Yue, Fei with its creation. This article is based on the Xingyiquan book, revised edition, by Grandmaster Liang, Shou-Yu and Dr. Yang, Jwing-Ming. 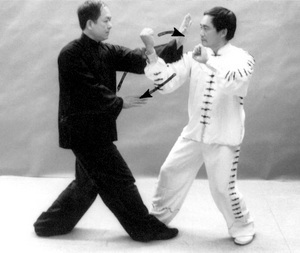 A Xingyiquan DVD demonstrating the techniques is also available.